If you have recently moved to Dubai or are moving home within Dubai one of the questions you should be asking your prospective landlord is proof that they have paid their service fees. If not you may soon find out that those lovely swimming pools and tennis courts you thought were free to use with your home are no longer available or even worse your garbage is no longer collected and is forming a nice pile outside your front door. 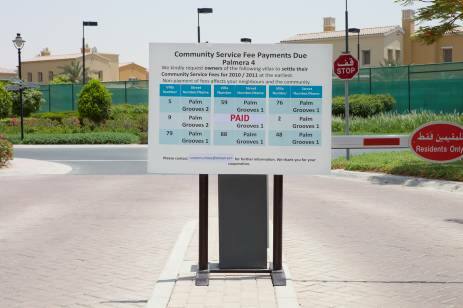 Recently anyone driving around the Emaar development of Arabian Ranches will have been greeted at the barrier to each compound by the sign ‘Community Service Payments Due’ then each villa that had not paid their service fees named for everyone to see. What does this mean? Well, basically it is a ‘name and shame’ campaign to make landlords pay their service fees – and it seems to be working by all the recent ‘PAID’ stickers. 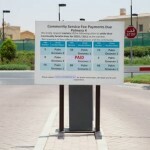 Unpaid service fees in Dubai have become a hot topic over the past year when in December the developer Nakheel banned residents of more than 1,300 units at Shoreline Apartments in Palm Jumeirah from using the facilities, including beaches, pools and gyms, because their owners had failed to pay the master developer’s service fee. Since most apartments were rented out, it was the tenants who were at the receiving end of service disruption, and not the defaulting owners. According to Arabian Business landlords may soon be required to declare whether or not they have paid service charges but until it is law ask to see some form of proof. This will help to safeguard tenants from unscrupulous landlords.